Dan's jangly and twangly (with some pedal steel flourishes sprinkled about), self-titled Kool Kat debut was co-produced by Michael Giblin (Cherry Twister/Parallex Project). Michael also plays bass and keyboards on the record. The record merges a pop/alternative air with traditional, straight from the heart, no chaser, country heartbreak. It's masterful, and it's original. This is guitar-entwined, roots pop at its finest folks! Dan is capable of taking a simple melody and infusing his heart felt lyrics with bite. Timeless sounds abound here, driven by Dan's gorgeously rough-hewn vocals, the thousand pound chops of the guitar-wielding Dan and John Fritchey, and the classy rhythm section of Giblin and Tony Melchoirre. "The razor sharp pop that forms the backdrop for his melancholy musings lingered for weeks after the first listen!" - Music Reviews Quarterly "His twin gifts are his hickory-smoked vocals and songwriting perched smartly inbetween introspection and sing-along popcraft." - Option Magazine "His music is rootsy as hell, but without any real or imagined Southern accent." - MOJO Magazine "I believe than Dan is a great creative talent who seems to get better with age. His thing is intense emotion, and he channels it through a great voice that gives his songs such texture. He lets you hear it in the way he can sing with a cracked, angelic grace over waves of guitar electricity, all nicely played with conviction by a great, backing band!" - Max Humphries Includes an extremely cool cover of The Zombies' "I Can't Make Up My Mind"! 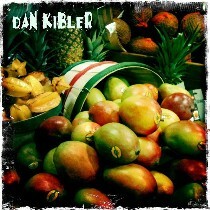 COMES WITH AN EXCLUSIVE 9-SONG BONUS DISC - "WHAT'LL IT BE: A DAN KIBLER MIXTAPE" - COMPILED BY DAN HIMSELF - FEATURING TRACKS FROM HIS TWO OUT-OF-PRINT BIG DEAL RECORDS RELEASES ("CAPSULE" AND "HAUNTED") AND HIS "FOREVERAGO" RELEASE! GREAT!!! !